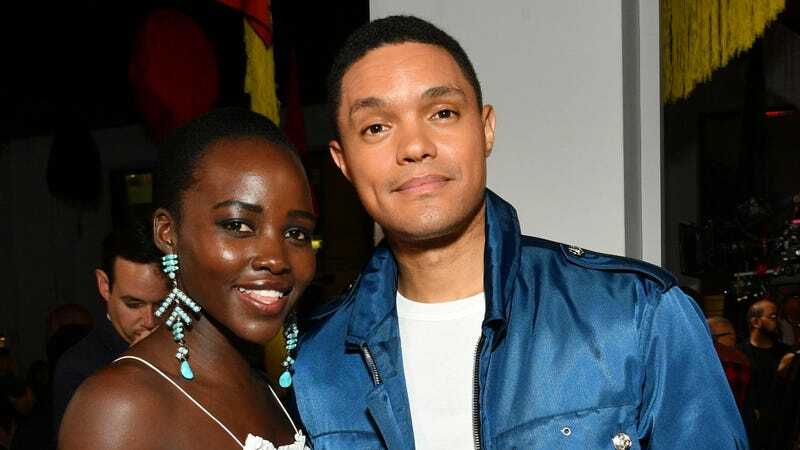 Lupita Nyong’o will play Trevor Noah’s mother in an upcoming biopic pulled from The Daily Show host’s memoir, Born a Crime: Stories From a Southern African Childhood. The book was published by Spiegel & Grau in 2016 and has won the James Thurber Prize for American Humor and two NAACP Image Awards. Noah focuses on growing up in post-apartheid South Africa as the son of a white father and black mother who had trouble fitting in. The book also provides details about his mother, Patricia, who grew up in a hut with 14 occupants and took her son to three churches every Sunday, a prayer meeting on Tuesday, Bible study on Wednesday, and youth church on Thursday. Noah does a bit in his stand-up show It’s My Culture about his brother calling him to say their mom’s been shot, at a time when she had no medical insurance. In an appearance on Live With Kelly & Ryan, he describes his mother’s obsession with raising chickens. Sounds like a sweet woman.